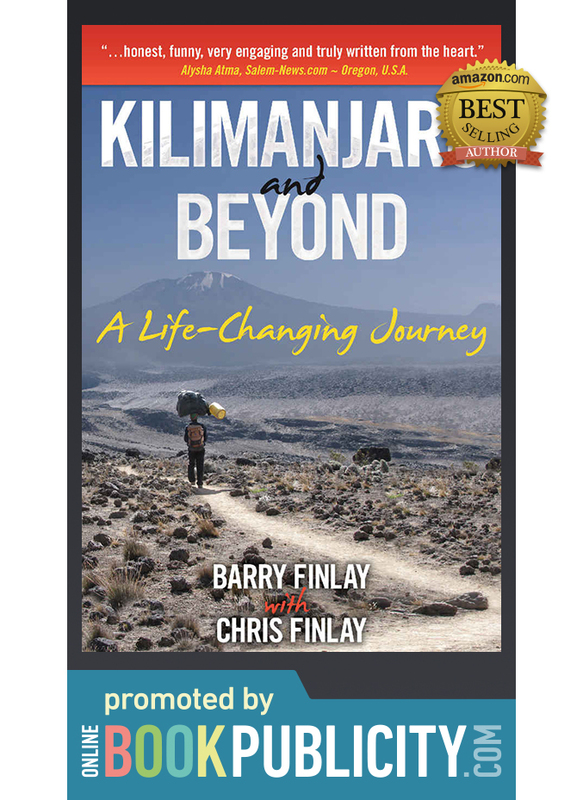 Inspirational Travel Memoir by Canadian Amazon Best Selling Authors Barry Finlay & Chris Finlay: Kilimanjaro and Beyond is now promoted by Online Book Publicity Services. Contact us about book promotion. BARRY FINLAY and his son CHRIS sit propped against a rock, struggling to draw a breath on Mount Kilimanjaro, Africa's highest mountain. Their destination is tantalizingly close but what happens next will be determined by their health and the weather. In their hands is a Canadian flag bearing the names of over 200 people who contributed to helping a desperate community in Tanzania. Kilimanjaro and Beyond is an award winner that is inspirational, thought provoking and entertaining. Follow along on the journey and realize that nothing is more satisfying than reaching a goal and giving others the opportunity to achieve theirs.